A sharp blade and the right technique can make field dressing easier. Here are five tools to help get the job done. If your main goal with hunting is getting delicious, long-lasting meat, then you need to be knowledgeable about field dressing. This crucial step must be properly done to prolong your meat’s life and to avoid health risks for yourself and others around you. Properly field dressing your meat can help you keep and enjoy it for over a year. Field dressing involves removing the internal organs and entrails from a game animal so that the meat may cool down quickly. This vital action needs to happen soon after you take the animal so that the meat doesn’t go bad. Bacteria begins to grow on meat almost right away, but field dressing will make sure that your game stays bacteria-free and clean. Once you have done this initial step, the meat must be kept in a fridge under 40 degrees Fahrenheit. Let’s look at some of the best field dressing knives on the market. These knives were chosen because of their reputation, customer feedback and overall user satisfaction based on performance and durable quality. Read below to learn more about each knife. The 113 Ranger Skinner Hunting Knife is a compact, sturdy fixed blade product with an Ergonomic, American walnut handle and brass bolster. The knife weighs 5.2 ounces, was made in the United States, and comes with a Buck Forever Warranty. The steel drop point blade on the knife has excellent edge retention and strength and the knife is 7.25 inches long. The knife has a genuine leather sheath and lanyard hole. The visual layout of this knife, with its brass guard and wood handle is reminiscent of a classic style, while the blade has a well ground, high-quality profile. The leather pouch is simple, offers a snug fit for the blade, and was made in Mexico. The knife feels great in your hand with a sturdy blade that comes sharp out of the packaging. It can be used to fillet fish easily and without struggle. This fine knife has a hollow ground blade with a perfect edge right out of the factory. Keep in mind that some may find that the handle is a bit small and too square for their tastes. For those who prefer to buy American made products, the ESEE-4 is just that. Well established with bushcraftsmen, the ESEE-4 is manufactured of tough 1095 high carbon 57 Rc steel. It comes with removable Micarta handle slabs and a Kydex sheath with MOLLE locks. According to one ESEE-4 Knife reviewer, “it is perfect as a camping knife, very comfortable and just long enough for my hands.” Another says you would have to seriously abuse it to break it. The overall length is 9.0 inches, the blade length measures 4.5 inches and the blade width is 1.25 inches. The handle is made with two removable lined slabs of Micarta. The entire knife weighs 7.4 oz. Its rugged construction works great for either tough or easier indoor tasks. Although its steel blade is coated, you must maintain it properly to prevent rusting. 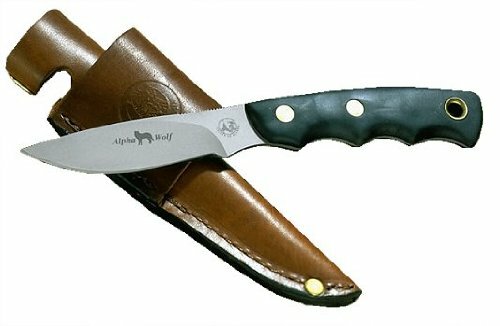 The Knives of Alaska Alpha Wolf is a great option for the weight conscious hunter and outdoorsman. The knife alone weighs a scant 3.2oz and with the leather sheath the total weight is a meager 4.9oz. Full-tang drop-point hunter-style blade, hand sharpened with special convex edge, is razor sharp. Slender .100" thinner blade reduces drag when skinning and fleshing, easy to resharpen. Double Drawn Heat Tempered for maximum edge holding ability. Comes with a high quality, vegetable-tanned, oiled leather sheath. I've personally owned one of these knives for several years and it has accompanied me on many of may adventures, including a caribou hunt on the North Slope of the Brooks Range in Alaska. It's available in both D2 tool steel and S30V. For those looking for something a bit more portable, the Gerber Myth Field Dress Kit is an ideal option. This field dress kit is perfect for the modern hunter with its compact design, textured rubber handle, and integrated, built-in carbide sharpener in the sheath. The piggyback sheath will keep both knives perfectly secure and fits securely into your belt loop or backpack. The knife has a blade of 3.75 inches, a sturdy rubber grip, and weighs just under 5 ounces. This knife can be used to field dress deer and will work well for making cuts, while the hook on the bigger knife makes it easier to dress and open up the skin of the animal. This is one of the only field dressing knives that comes with a built-in carbide sharpener, which makes it the perfect hunting companion as you won’t need to wait until you get home to sharpen your blades. It can be used for both large and small game hunting and the blade is perfectly sharp immediately after unpacking it. The set has a reasonable price and the knives are sharp and well built. Rest assured that your blades will be held in place in the blind or on long day hikes. The large one clicks into place while the smaller knife comes with a strap to secure the blade. The belt strap is thin and flatly stitched, which some might have an issue with as it doesn’t leave much slack on the belt loop. Buck knives are extremely well made, and the 393 Omni Hunger 12pt Guthook is no exception. The 4-inch blade offers excellent corrosion resistance, edge retention, and overall strength and will be your constant field dressing companion out on the hunt. The knife weighs 7.8 ounces and is 9.75 inches in total with a full length tang. The handle is heavy duty with an ergonomic shape and a groove for your index finger. The knife comes with a snap closure, black nylon sheath, was crafted right here in the USA and comes with a Buck Forever Warranty. It has a lanyard hole for simple attaching so you don’t lose it out on the trail. The handle has grip ridges and is contoured and rubberized for safe handling. These knives are ready to take out for hunting and surgically sharp right out of the box. Just strap it on and you’re ready to dress your first elk of the year. While other knives can be easy to lose your grip on, this one’s indentation will keep it held securely in place. With such quality, you’d expect an outrageous price, but this blade is very reasonable. The knife is full tang which can be verified by looking at the metal in its cutout, near the handle’s end. Many knives cannot be used immediately but this one is ready to use right after buying it. The rubber handle stays warm even out in freezing temperatures and although the knife is a bit heavy, it makes up for this in durability and overall quality. The camouflage pattern on the knife’s handle goes well with plenty of other hunting gear and won’t give away your position. Give it as a gift to the hunter in your life or buy it and enjoy it yourself. This blade is sure to last for years and years with proper care and maintenance. Field dressing your game properly is a crucial step to both preventing bacteria and preserving the meat for as long as possible. Methods for doing this depend on how large your kill is. For instance, while deer can be kept whole, moose or elk may need quartering or halving so you can transport them home, and to aid in quicker cooling. So, what else should you bring out with you, in addition to your field dressing knife? Additional Equipment for Field Dressing: In order to make sure you’re field dressing properly, bring a small hatched, sharp knife, steel or Whetstone for sharpening, rubber bands, nylon cord or rope, Clean paper towels or cloths, large Zip lock bags, a cheesecloth, black pepper, a big cooler filled with snow or ice, clean water (for drinking), and disposable plastic gloves. Field Dressing Quickly: Several methods exist for field dressing your kill. Many people differ on the size or manner of incision for intestine removal, but regardless of the method you use, you must eviscerate your kill immediately after shooting it. When you dress it right away, you will prevent bacteria from forming, ensure rapid body heat loss, and make the meat quality better. Bleeding Guidelines: Contrary to popular belief, it’s not always necessary to bleed your kill. Usually, a bullet wound to the liver, heart, or lungs is enough to complete this step. However, in some cases, it may be necessary so always use your best judgment. Keep in mind that while field dressing, wearing disposable plastic gloves is crucial in order to prevent exposure to harmful diseases. If you have no gloves, make sure you wash both your arms and hands in water and soap both after and before you dress the animal.